Someone I know used to call his Honda Valkyrie the "Hondasaurus." We ribbed him by calling it the "Hondapotamus" instead. No matter how you slice it, the Valk is a big heavy power cruiser and is not ashamed about it. One particular 2014 Valkyrie, however, has gotten a complete makeover at the hands of H Garage, as well as a serious diet. After initially declining the project, Scott Halbleib's creative gears started turning inside his head with a vision of what this bike could become. He drew up a streetfighter design that still retained the basic Valkyrie guts underneath. 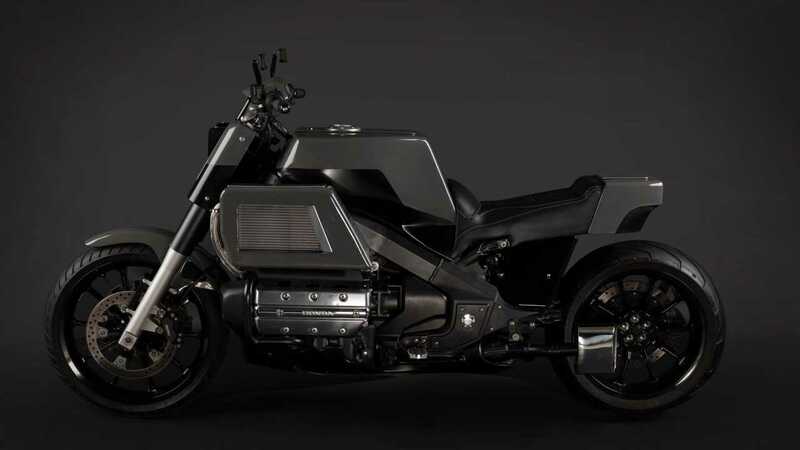 Originally weighing in at 752 pounds, the bike lost a great deal of that weight, with just the frame, wheels, suspension, and running gear remaining in place, including the Valk's 1,832cc flat-six engine. The original gas tank also stuck around, though you wouldn't know from looking at it. Halbleib crafted an angular shell to match his vision for the bike's new appearance and connected it to the original tank to prevent fuel spillage. Elsewhere, Halbleib had more flexibility in his design. He cropped and chopped the tail as he does with all H Garage builds, adding a rear cowl and integrated LED lighting along the way. A pair of fog lights found new life as the front turn signals, and two vertically-mounted LED headlights give the bike an aggressive, unconventional appearance. More subtle is the shortened subframe, radiator covers, and custom leather seat. The rider also gets low-rise Biltwell handlebars and new grips, mirrors, and footpegs. Halbleib replaced the mufflers with Borla tips and found that the catalytic converter did a great job of quieting the beast all by itself. The shortened exhaust shows off the custom single-sided swingarm, as well as the back wheel boasting a large 180-width tire. No performance specs are available, but one might imagine that with the serious weight reduction involved with this build it's quite a bit faster than the original bike, with performance further enhanced by a Power Commander. The end result may not be to everyone's aesthetic taste, but it is certainly a unique transformation of the Valkyrie into something special.